Great gift ideas for the youngsters on your holiday shopping list! "Brown Books Kids has a variety of entertaining and educational titles for all ages that make ideal gifts for every age, from preschool to teens"
The holidays are here and we’ve already started stockpiling our gifts! Children are often difficult to shop for, but Brown Books Kids has a variety of entertaining and educational titles that make ideal gifts for every age, from preschool to teens. 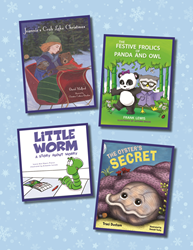 Whether it’s from Santa, Mom and Dad, or other family members and friends, the lucky kids who receive these books will enjoy story time with their loved ones all year long. This heartwarming story by former US Ambassador David Mulford, releases December 1. For the last 27 years, David’s Christmas gift to his wife, Jeannie, no matter where they’ve been in the world, has been a new story with their home-away-from-home, Crab Lake, Wisconsin, as the setting. The love from this almost 30-year tradition is poured into every page and it transports readers back to the tales we loved as children. With its touching illustrations and themes of tradition and holiday spirit, this book is sure to become a classic. What started as a romantic gesture between the author (Owl) and his wife of one year, Jody (Panda) has transformed into a wonderfully whimsical tale of two best friends who learn, laugh, and celebrate life hand-in-hand. “When my wife and I began dating, I told her I was going to write a children’s book for her,” Lewis says. “I would ask her to come up with a theme for each chapter. And before every special occasion or holiday, I would present her with a new chapter. So this is my attempt to be romantic.” The two are inseparable in fiction and in real-life, and you’ll want to become their “bestest” friend, too. The Festive Frolics of Panda and Owl has a claim to fame…it will be the only children’s book featured in the 2018 Golden Globes Red Carpet Style Lounge. This sweet story follows the unassuming Mr. Oyster as his sea creature friends boast about their beauty and talents. However, Mr. Oyster is not bothered one bit, because he has a secret gift of his own! After being shown all the amazing talents his underwater friends possess, the oyster opens his mouth to reveal the beauty he holds inside—a large pearl. This story is about a young worm that has long planned that today was the day he would run a mile in the bright, shining sun. But, when he wakes up on the morning of his greatest achievement, he looks out the window only to find the sky gray, with rain falling harder every minute. He must learn to handle his disappointment and nerves while finding an alternative activity, and, eventually, he decides to run anyway! As a Licensed Marriage and Family Therapist and Registered Play Therapist, Pierce encourages open dialogue about emotions between children and their caretakers. Benjamin Birdie encourages kindness and compassion to overcome life’s challenges. Elephants, giraffes, lemurs, and more work together to get you off the forest floor! All of these animals have one thing in common: they all try to help Benjamin Birdie back to his nest when he falls from the top of his tree. The Little Copper Penny promotes the concept of self-confidence and the importance of knowing your worth – because everyone is worth something! It not only teaches kids the basics of making change and the monetary value of quarters, nickels, dimes and pennies but also demonstrates the important opportunity parents (and grandparents) have to instill self-worth in their children. Founded by Milli Brown in 1994, Brown Books Publishing Group is a full-service, independent publisher of high-quality books across all genres, from nonfiction to fiction. Committed to producing award-winning books for authors who choose to retain the rights to their intellectual property, Brown Books publishes more than one hundred titles a year and has won numerous prestigious awards, including the Writer's Digest Grand Prize, Mom's Choice Award, Foreword Book of the Year, Gold Ink Award, Axiom Business Book Award and many more. Brown Books authors have appeared on programs and channels such as the “Today” show, Fox News, “Face the Nation,” CNN and BBC News. They have been featured in publications such as USA Today, Publishers Weekly, and The New York Times. In addition, BBPG authors have been guests on NPR programming, including “The Diane Rehm Show,” “Morning Edition,” “The Takeaway” and “Tell Me More.” To learn more, visit http://www.BrownBooks.com.